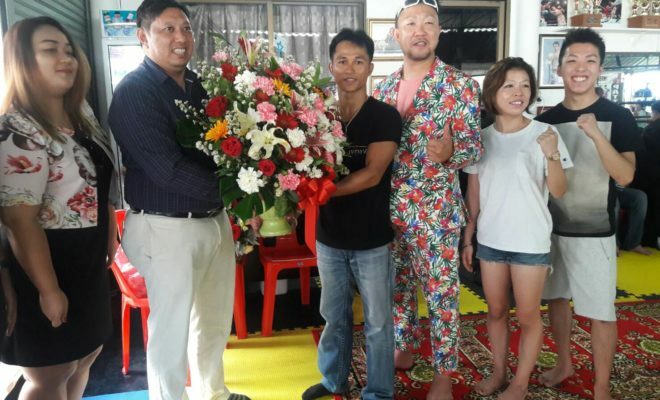 At 10am on the 1st of April, a grand opening was held for the Eagle 432 Muay Thai Camp, on Soi North Pattaya 7. The owner of the gym, former WBC World Champion, Den Julapan AKA Eagle, welcomed guests to the grand opening, starting with a Buddhist prayer blessing and donation ceremony, conducted by monks. Guests were then invited to eat lunch, including Vice President of the Pattaya Lawyer Council Sub. Lt. Chanyuth Yangpreeda, who presented a flower basket to Eagle Den Julapan. Eagle 432 Muay Thai Camp opens daily from 8am-9pm with special shows running twice a day.